In small saucepan over medium-high heat, bring vinegar to simmer. Continue cooking until vinegar is reduced to 1/4 cup. Whisk in sugar; set aside to cool. 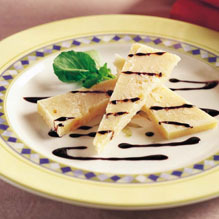 For each serving, plate 3 spears of cheese. Drizzle over 1/4 of the reduction. Garnish with watercress sprigs.